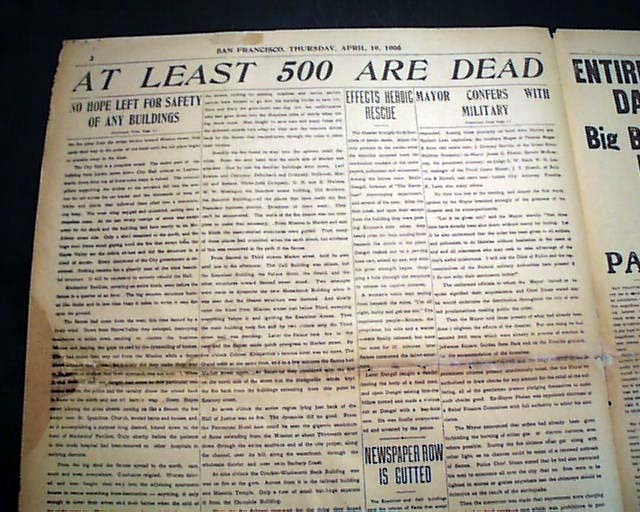 THE CALL-CHRONICLE-EXAMINER, San Francisco, California, April 19, 1906 This newspaper is destined to be--if not already--one of the premiere issues of the early 20th century. 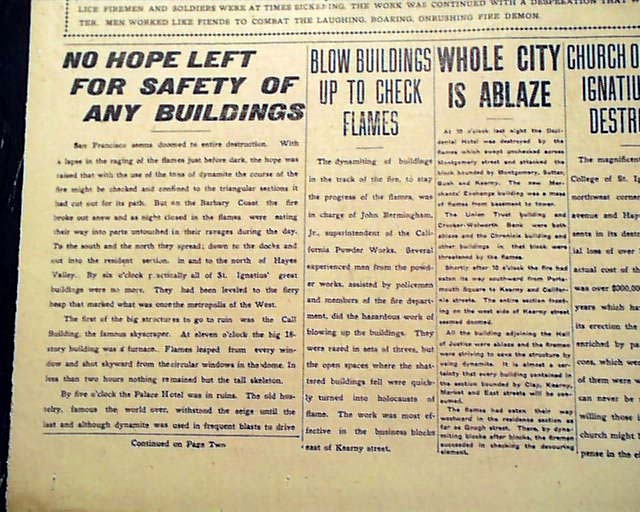 See the photos for the great headlines and reports found on the front page. 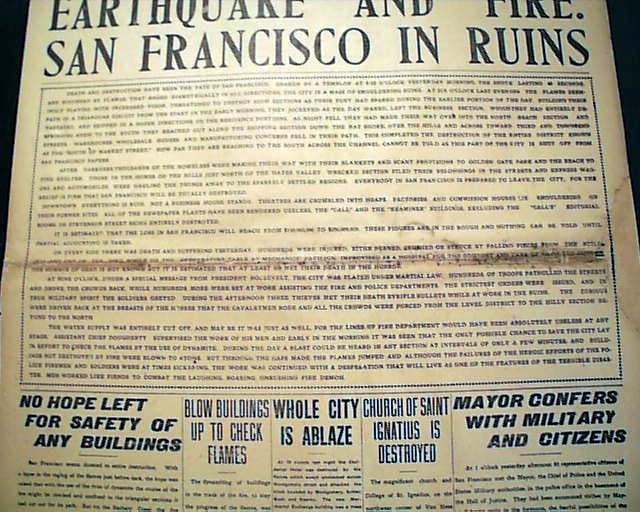 Due to the destruction of the presses in San Francisco, these three separate & competing newspapers combined under one masthead for this issue, printing the paper of this date across the bay on the presses of the Oakland Tribune. 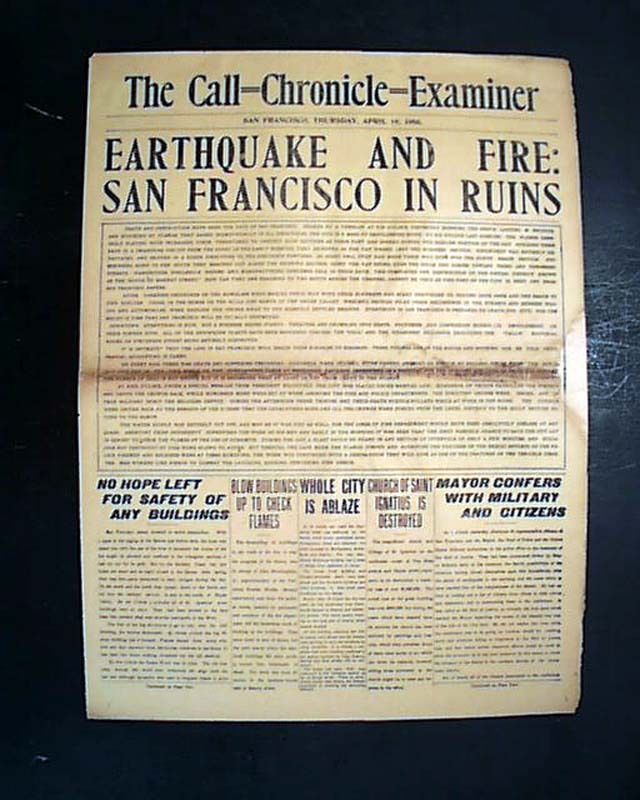 This issue is noteworthy in containing no advertisements but rather is replete in its four pages with reports on the earthquake and fire. 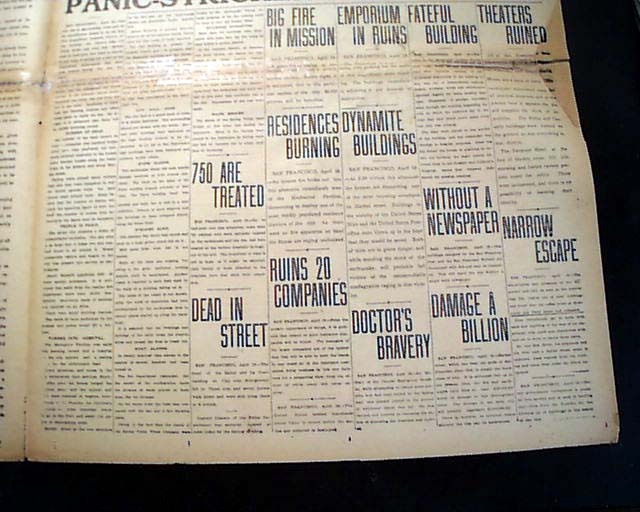 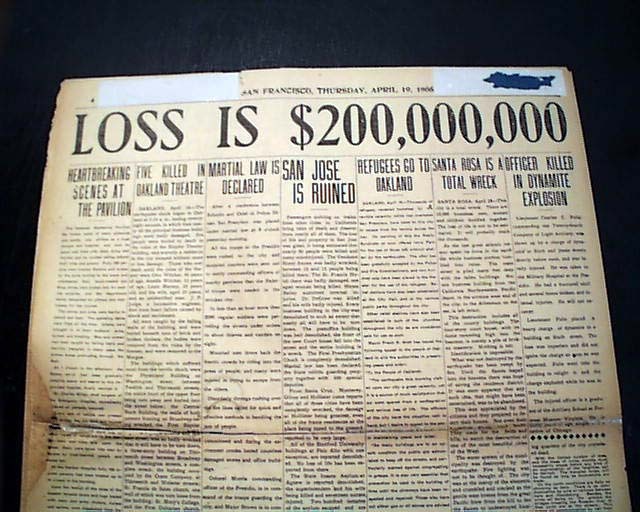 Plus banner headlines on pages 1, 2, 3, and 4 which was almost never done at that time, and which include on the front page: "EARTHQUAKE AND FIRE: SAN FRANCISCO IN RUINS" and on inside pages: "At Least 500 Are Dead" "Entire City of San Francisco In Danger of Being Annihilated" "Panic-Stricken People Flee" "Loss Is $200,000" along with many, many large-type one column headlines. 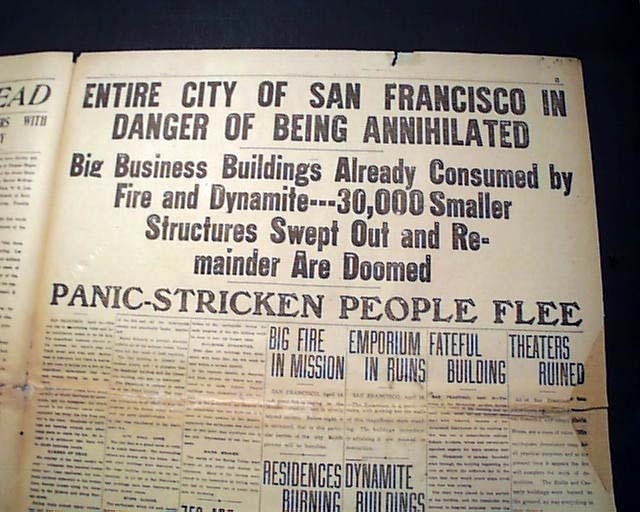 Also worth noting is the missing dateline at the top of page 3 as this page is actually the same as the Oakland Tribune edition of April 18--they used it over again for this combined San Francisco issue. 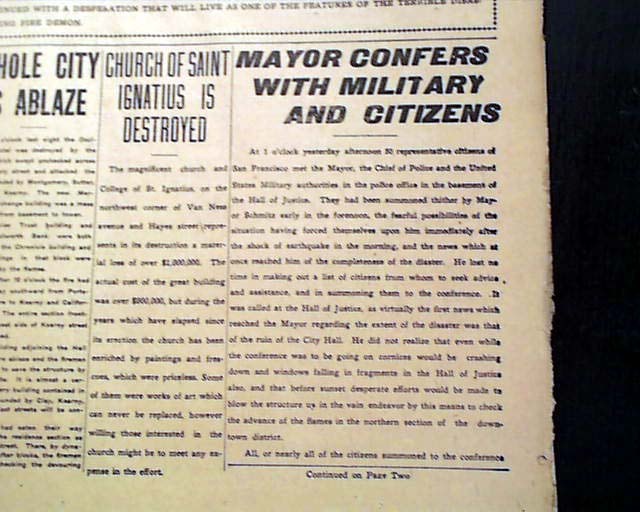 Complete in four pages, repair replacement paper where there was once loss at the right margin, browning at the central fold, archival mends to the fold inside, mounting tape at the top margin of the back page affects no text.